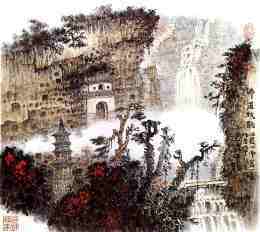 In 756 Lu Yu arrived at Huzhou in Zhejiang province. He visited Miaoxi Monastery and met Monk Jiaoran the abbot of Miaoxi Monastery. Monk Jiaoran, a Buddhist monk well-versed in Chinese literature was popularly known as "poet monk" of the Tang Dynasty. That was not all about Monk Jiaoran; he was also a well known "tea monk" like Zen Master Zhiji of Longgai Monastery. We shall learn more about Jiaoran as the story unfolds. After a few meetings Lu Yu and Monk Jiaoran became good friends and Lu Yu stayed as guest in Miaoxi Monastery. Since returning from his expedition in Bashan Xiachuan Lu Yu had gathered lots of tea samples, notes and information on tea in the wild, and data on tea trees in their natural environment. What Lu Yu lacked at this juncture was short of experience in tea cultivation and production. Also lacking at this time was his knowledge on pottery. The civil war turned out to be a blessing in disguise for Lu Yu. Moving south to Zhejing and Jiangsu province allowed Lu Yu to get close to many tea farms and tea production areas. Pottery was also closely related to tea culture and Jiangxi Province was traditionally famous for its fine pottery and skilful craftsmen. Besides his new friend Monk Jiaoran was well-versed with tea cultivation and production. Some historians suggested that Monk Jiaoran, many years Lu Yu's senior might have played an influential key role probably as an advisor, consultant or editor during the creation of Lu Yu's Cha Jing. During this period Lu Yu visited various tea farms and worked in some of them to gain hands-on experience on tea cultivation and processing. While working in these farms Lu Yu initiated a series of quality processes and became the first man to set up quality control for tea cultivation and production. Two years later Lu Yu and Monk Jiaoran travelled to Shenzhou(presently Nanjing City in Jiangsu Province) and stayed at Xixia Monastery in Xixia Mountain. Here Lu Yu started compiling and categorizing his notes and the tea samples that he collected from over 32 districts during his extensive travels from the area of Bashan XiaChuan to the tea farms and production areas in the fertile Jiangsu, Jiangxi and Zhejiang provinces.